I'm not generally a fan of 'sports drinks' as I see no need for them during normal (i.e. non-endurance) exercise activities, especially if you want to lose bodyfat! In my last post (Energy, fuel systems & fat burning 101) I talked about how the body generates fuel from the food we eat and briefly touched on what we need to do in order to encourage our body to lose the excess fuel that we've stored as fat. Glucose-based energy drinks are extremely efficient fast-acting energy and fuel providers. This is because they contain simple sugars which the body absorbs immediately into the bloodstream - it doesn't even need to break them down at all, like it would if you'd eaten a plate of complex carbohydrates like rice, pasta or vegetables. So, if you are a) engaging in a long-distance/endurance activity where you're likely to be active for well over an hour, or b) have just finished an intense weight training session and want to re-stock your muscle glycogen stores and encourage muscle repair and growth (yes, if you want to build muscle you need protein AND carbohydrates! ), then in addition to a protein shake, some fast-acting muscle fuel might be just what the doctor ordered! Personally though, I'd recommend a banana over a high glucose-drink like for this purpose, simply because of the amount of sugar it provides. Yes, that really *does* say 52.4g of sugar per bottle! That's more than 10 teaspoons of sugar, instant-access glucose which is going to hit your bloodstream - POW! Bearing in mind that the GDA (Guideline Daily Amount) of sugar for a woman is 90g per day, that's quite a substantial proportion right there, over half in fact! Do you really think you're going to use up all of that sugar? I guess it's possible but if you don't where is it going to go - yup, our primordial starvation-thwarting-mechanism will kick in and any excess will be stored as fat! Foods like oats and brown rice release their energy slowly and over a sustained period - this makes them ideal fuel sources if you want to avoid energy dips or hunger pangs soon after eating a meal and also sugar/energy spikes too. The latter being particularly important because if we flood our bodies with too much sugar over a prolonged period of time, insulin becomes overloaded and inefficient at mopping up the excess glucose in our blood. This results in less of it being produced and/or the cells in our bodies becoming resistant to its effects, leading to type 2 ("adult onset") diabetes. Not good!! Unfortunately however, one important thing has been left out of this 'lite' sports drink, and that is taste! It reminded me of the watery squash they serve at my son's parent's evenings, it was frankly quite disappointing! So you can now see why I shy away from 'energy drinks'. The lighter versions taste like an over-diluted version of their original counterparts and, unless you're whippet thin and/or you're out for a 4 hour cycle or a 90 minute training run, the full-sugar versions are really not needed! So imagine if you were to hear of an sports energy drink which worked not by providing carbohydrates for fuel, but by encouraging your body to burn its own fat stores for energy... that would be pretty cool huh?! Well, Multipower have come up with a drink that does just that! L-Carnitine is a nutrient whose sole function is help convert fat into energy. Ah - ha! Now I have your attention right? L-Carnitine is often referred to as a non-essential amino acid, although it is not one in the classic sense. Carnitine's role is to transport fatty acids into the mitochondria (central powerhouses) of your cells where it is then converted into energy ready for immediate use. This process provides muscular energy by burning fat, and also prevents fatty build-up around vital organs such as your heart and liver. * improving memory and mental capacity - may help delay the progression of Alzheimer's disease and relieve senile depression and other forms of dementia, and improve memory in the elderly. This is just a collection of the widespread health benefits I have read since researching into L-Carnitine (I've included a few links for further reading) and studies are ongoing as to just how beneficial this nutrient actually is but it all sounds terribly exciting to me! I love the slim sports bottle. The actual top of the bottle is foil sealed for extra freshness and it's got a proper sports cap. 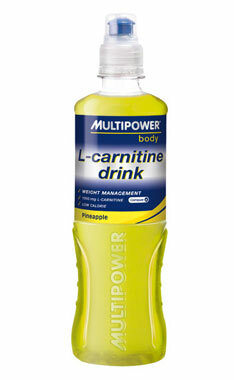 I tried the pineapple flavour L-Carnitine drink and absolutely loved it. It's fruity and tangy and not a bit too sweet or sickly - there is enough flavour there to satisfy, in fact it's really very moreish! It's hard to believe there are less than 10 Calories a bottle! Before my ankle surgery, I was drinking Multipower's L-Carnitine drink before heading down to the gym for cardio sessions at lunch and also 30 minutes prior to my boxercises classes. I really felt that it helped with energy levels, especially during boxercise which was fabulous as at the time I was on a reduced carbohydrate diet and my energy levels had dipped somewhat - I didn't notice this happening after taking the drink though so that has to be good news! My body fat was reduced at the time, but because I'm not a scientist I cannot say whether that was solely due to the L-Carnitine drink as my activity levels were high and my calories were relatively low. However, since L-Carnitine plays such a key part in fat mobilisation I'm hopeful that it contributed to my fat loss. The only bugbear I have with Multipower is the fact that they sell their products in such huge packs, their L-Carnitine drink is no exception to this and you have to buy a minimum of 24 bottles at a time. If you buy bigger quantities you pay less... but I'd really like to see an option to buy a pack of 12 and I think that would encourage more people to do likewise as there's not such a large initial outlay. A mixed pack would be good also, can't wait to try the cranberry flavour! Price-wise, it's about 50p more expensive than a bottle of Lucozade Sports Lite but seeing that I think more than £1 is far too much to pay for a little sugar and electrolyte water that tastes like weak squash, I'm more than happy to pay the extra! L-Carnitine naturally occurs in red meat and other animal source foods, but you'd have to eat over a kilo of beef before you could match the quantity in one bottle of L-Carnitine drink! Oh and unlike 'normal' sports drinks that you see people gulping down mid-exercise, Multipower's L-Carnitine drink should be drunk about 30 mins or so before you engage in any physical activity so that it can get to work before you do! I think that's it for now, this was only meant to be a brief review but as you can see it's turned out to be anything but! I'll leave you for now with some links at the bottom to browse if you're after any more information on L-Carnitine and its health and/or fitness benefits. Bye for now, stay strong! Lucozade Light in the berry flavour tastes great jsut a pity they are soo expensive. Hey, really great blog posts… I've enjoyed reading through your blog because of the great style and energy you put into each post. I actually run AceHealth.org, a blog of my personal research and experiences. If you're interested, I would love to have you on as a guest blogger. Please send me an e-mail: bob.mauer65(at)gmail(dot)com, and I can give you more information. Looking forward to hearing from you. I do a lot of cycling and use something called Bike Food it seems to work very well and I believe contains only "good" stuff. Sure it would be great for other exercise. Well, good drink .It is very helpful to maintaining the strength of human body and Good flavours.Keep it up. Long time reader, first time poster! L-Carntine sounds like a good option. I might have to invest! Nice work here,Thanks for sharing this.Keep it up.